Feliciano Peña was born in Silao, Guanajuato, April, 25, 1915 and moved to Mexico City in 1926. He began his career as a painter at the Open Air School of Coyoacan, studying with Tamiji Kitagawas and Francisco Díaz de León in 1927. 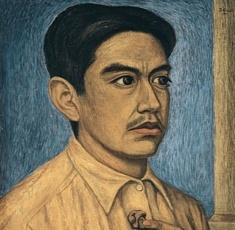 His early production one can see a primitivism, excellent in drawing and plenty of color, his culmination was a Selfportrait. Later, he was dedicated himslef in landscape. From 1931 to 1937 Peña was member of the League of Revolutionary Writers and Artists. In 1933, he presented his first solo show at the Ministry of Public Education´s Art Room. He received an acquisition prize at the Annual Salon of Painting held by the Salon de la Plástica Mexicana. He was a founder of it as well as of the Sociedad Mexicana de Grabadores in 1947.